· A simpler, more direct writing style. Two million copies of the Player’s Edition will be distributed in the United States and its territories and Mexico by the USGA and a similar number in the rest of the world by The R&A, all with the support of Rolex. The new book will be translated into more than 30 different languages. A new Official Guide to the Rules of Golf is also available in digital, on website and app, from today, with a printed version being released in November. Designed for golf administrators and club officials, the Guide features Interpretations on specific Rules (which replace the current Decisions) and includes the first jointly-produced Committee Procedures document providing practical guidance to Committees for running competitions and overseeing general play. Extensive educational programmes are being conducted around the world, with the assistance of national and regional associations, to ensure that golfers and administrators throughout amateur and professional golf are ready for the new Rules when they take effect on 1 January. 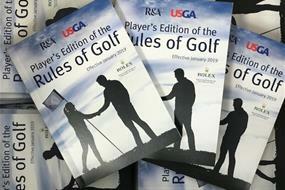 The R&A will publish in English a total of 2 million copies of the Player’s Edition of the Rules of Golf effective 2019, with 1.4 million printed in the UK and 600,000 in Australia. The UK print run will cover Great Britain and Ireland and all international deliveries, excluding Australia and New Zealand. The Player’s Edition will be delivered to 99 worldwide destinations. Approximately 800,000 copies have been distributed among over 3,000 clubs and societies in Great Britain and Ireland. Almost 65,000 copies of the full Rules of Golf have been produced, with copies going to clubs and societies in Great Britain and Ireland, and to national associations around the world. Copies of the Rules of Golf are reproduced under licence in 38 languages, in addition to English: Arabic, Burmese, Cambodian, Chinese (simplified), Croatian, Czech, Danish, Dutch, Estonian, Finnish, French, French Canadian, German, Greek, Hungarian, Icelandic, Indonesian, Italian, Japanese, Korean, Latvian, Mandarin, Norwegian, Polish, Portuguese, Portuguese (Brazilian), Romanian, Russian, Serbian, Sinhala, Slovakian, Slovenian, Spanish, Spanish (South American), Swedish, Thai, Turkish and Vietnamese. Rolex’s relationship with The R&A dates back to 1978 when the company first began to support The Open Championship. In addition to the Rules of Golf, Rolex also support the Amateur Championship, the Walker Cup and the Junior Open. Rolex also sponsors the British Golf Museum and is the presenting patron of the Senior Open. Companion publication to the Rules, the Official Guide to the Rules of Golf, is published in November 2018 by Hamlyn and is available from high street and online bookstores. In addition, the Rules of Golf, the Player’s Edition of the Rules of Golf and all the additional content from the Official Guide to the Rules of Golf, is available on The R&A’s website (www.randa.org) and as an R&A Rules of Golf App, free of charge. The R&A Rules of Golf App also includes the content in Spanish, with more languages to follow. The USGA conducts the US Open, US Women’s Open, US Senior Open and the US Senior Women’s Open, as well as 10 amateur championships and international matches, attracting players and fans around the world. Together with The R&A, the USGA governs the game worldwide, jointly administering the Rules of Golf, Rules of Amateur Status, equipment standards and World Amateur Golf Rankings, with a working jurisdiction in the United States, its territories and Mexico.